For Something So Good, You’d Never Guess These Chips Were This Easy To Make!! Potato chips are a guilty pleasure of ours, but we don’t even have to feel guilty about these! Sweet and spice-y, these sweet potato chips are way healthier than the kind you grab at the gas station check-out, so you can dig into a huge bowl and feel good about the nutrients you’re getting. 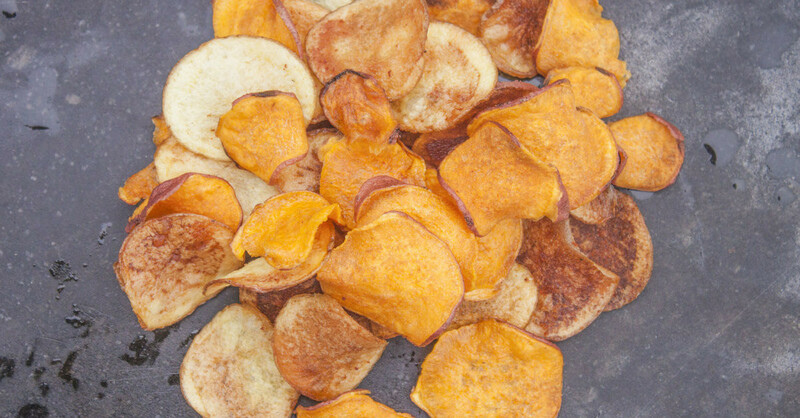 Seeing as they’re baked instead of fried, these chips make a delicious snack that’s good at any time and won’t derail your meal plan…plus, there are only two essential ingredients (sweet potatoes/potatoes and olive oil), so it’s basically the easiest thing we’ve put together in weeks. Win-win! Using a mandolin, vegetable peeler or a sharp knife, thinly slice sweet potatoes and place them in a large bowl. Drizzle salt and olive oil (and brown sugar or paprika, if using) over the potatoes and toss so that each is evenly coated. Spread potatoes out in an even layer on a baking sheet and place in oven. Bake for 20-25 minutes, flipping over in the middle, or until sweet potatoes are crisp and edges are browned. Remove from oven and sprinkle with another pinch of salt (optional), then serve immediately and enjoy!